My dad’s request was that donations in his honor be made to my efforts for the Pan Mass Challenge and Dana-Farber. BANGOR – Charles Frances Seguin went to be with his Lord on May 8, 2018, at his home on Palm Street, Bangor, ME. Chuck was attended by his wife of 45 years, Lonna. He was born on June 27, 1949, in Newport, RI. He was a graduate of Central High School, Providence, RI, and the University of Maine. Chuck served honorably in the US Coast Guard from January 1969 to January 1973. He was predeceased by his parents, Nancy and Howard Adams, Sr.; Albert and Doris Seguin, Sr.; Lonna’s parents, Lyston and J. Winifred Trefethen, and sister-in-law, Norma Karram. He is survived by his wife, Lonna, their sons, Andrew P. Seguin and his wife, Michele Decker, Baltimore, MD, and Timothy A. Seguin, of FL, He is also survived by grandchildren, Shannon and Adam Decker-Seguin; his brothers and spouses, Albert and Arlene Seguin, Howard Adams, Donald and Eileen Seguin, Kenneth and Gabrielle Seguin, and William and Carole Seguin; plus several nieces and nephews and their families. Friends and relatives of Chuck are invited to A Celebration of Remembrance at First United Methodist Church, 703 Essex St., Bangor, on May 19, 2018, at 2 p.m. with Rev. Arlene Tully officiating. The family also invites those who wish to join in conversation and refreshment to the Family Room following the service. Those who wish to remember Chuck in a special way may make gifts in his memory to the Pan Mass Challenge using pmc.org/AS0171. A service of Brookings-Smith, Bangor. I have been quiet for a while now – not sure anyone noticed, but that is about to change. As many of you know, my dad was diagnosed with stage IV pancreatic cancer in July 2014. The last two years in particular have been hard. Other health issues resulted in him stopping chemo last Spring and resulted in repeat emergency room visits of increasing concern and severity. 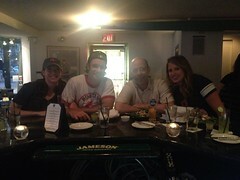 Last August, after the PMC, we got up to visit him and my mom in Maine so he could see Shannon and meet Adam. At the time, I could see the toll that everything had taken on him, and suspected that this might be the last time he would get to see his grandkids. In February, my mother called and told me to come say goodbye to him as he was again in the emergency room and the prospects were dim. I did get up to Maine to say goodbye to him, then he rallied that weekend and was well enough to leave the hospital again. For one last time. At that point, we all agreed that he would go into hospice, at home. It was a slow downward slide for much of the last three months, but over the last couple of weeks, things started to go downhill much faster. On Tuesday afternoon (5/8/18), he passed away. Finally, after years of illness, no longer in pain. Thank you in advance for the support, love, prayers, and thoughts that you will send to me and my family. Friends and relatives of Chuck are invited to A Celebration of Remembrance at First United Methodist Church, 703 Essex St., Bangor, on May 19, 2018, at 2 p.m. We also invites those who wish to join in conversation and refreshment to the Family Room at the church following the service. My dad’s request was that who wish to remember him in a special way may make gifts in his memory to my Pan Mass Challenge ride. Please donate at pmc.org/AS0171. The PMC has just announced a record-breaking gift of $51 million. That brings the PMC’s 38-year total gift to Dana-Farber Cancer Institute to $598 million and makes this the 12th consecutive year of 100 percent pass through of rider-raised revenue! The Weekend Begins in Acton. Bill joined us for the drive to Sturbridge. This was our team’s charter bus to our Friday night accomodations! Early on Saturday morning – ran into good friend David and Kermit! It sounded like a gunshot. Bill’s tire blew! Riders said they heard it a half mile away. At the World Famous Forza-G Pie Stop. Mile 100 on Saturday. It was rainy all day! Later this morning, my father-in-law Norm and I will be heading out to Sturbridge, MA to get ready to spend our weekend on our bicycles. It’s Pan-Mass Challenge weekend – this will be my 11th ride and Norm’s 3rd. 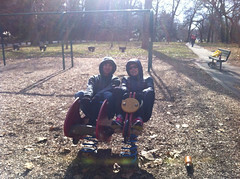 Cycling has become a year-round activity for both of us, so training for the ride never stops. I will often be asked during the year “Are you doing the race again this year?” or “are you ready for your race?” I try not to correct them anymore – “it is ride, not a race”, I used say. Because the cycling event itself is a supported ride, across Massachusetts. But it is a race. The race is to see how quickly we can fund the curing of cancer. I ride in 38 degrees in February thinking about cancer. I ride in 95 degree heat in July thinking about cancer. I ride the PMC, thinking about cancer. Thinking about all the pain and suffering cancer has given me. Thinking about all that cancer has taken from my friends and their families. Thinking that one day soon, cancer will be defeated. To me that means, the researchers and doctors that the PMC funds and others will have discovered and mastered the mechanisms to make cancer cells obsolete quickly and at low impact to the individual when they show up in the human body. Not some. ALL. Period. End of story. End of cancer. It is a race. While we are getting closer to this day each and every year, we are not there yet. My dad has been going through treatment for 3 years now for pancreatic cancer with no end to treatment in sight. The mother of my daughter’s best friend has been undergoing breast cancer treatment for months now. One of my PMC teammates just lost his cousin 10 days ago. In the past 12 months, I know of countless other people who have similar stories. Who do you know that is going through cancer treatment right now? Or has recently? Have you ever wondered…. who’s next? I know I do. I look at my wife, who hadn’t met yet when I beat cancer the first time, and wonder if she’ll have to deal with cancer someday. I look at my 7 year old and am so thankful that I am able to watch her grow up – she was 1 when my cancer recurrence happened and we didn’t know what was next. And now with our 4 month old son entering the world, I pray that both my kids will never have to hear the words “you have Hodgkin’s Lymphoma” with knowledge that there is an ever so slight genetic component involved with the disease. It is with all this on my mind this morning, that I finish packing and head out to Sturbridge, ready to ride a bicycle 192 miles in the next two days. The 6,200 cyclists that I will be riding with this weekend all do this to raise money for life-saving cancer research and treatment at Dana-Farber Cancer Institute (DFCI). The PMC raises more charitable dollars than any other single event in the country – $547 million since 1980 and $47 million last year alone. This year’s goal is $48 million. Your donation brings us Closer by the Mile to ending cancer. You have generously donated in the past. I hope that this note finds you well and that you will again make a donation that is going to save lives. We are PMC and Now We Ride! 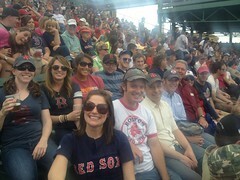 100% of your donation will go to cancer research and treatment at Dana-Farber Cancer Institute through its Jimmy Fund. I have made a personal commitment to raise $10,000. I hope you can you will again support my fundraising effort. I hope this note finds you well and enjoying the summer. Usually by now, I have already written a number of posts inviting you to make a donation to my Pan Mass Challenge ride. This year, a couple of things have kept me from my typical schedule. First, and foremost, our family grew by one this spring, when Adam Winston joined us on April 6. Being a two-career household, balancing the unique schedules and needs of a 7-year old and a newborn, well, something had to give… in some part that has been my blogging and fundraising for the PMC. Happily, with the patience and accommodation of Michele, Shannon, and Adam, I have done more training for this year’s ride than I have ever done in the past. The bike has become my physical and mental therapy, a steady pick-me-up, a much-needed break from the swirling and shifting that our world is in 2017. While this will be my 11th PMC, I can honestly say that I truly started to enjoy cycling about 4 years ago and now am in love with it. My time with family and my time on the bike has left only fleeting moments here and there in which to even contemplate fundraising and continue to advocate for cancer research. It does help that Shannon likes to go for 10 mile trail rides every now and again! My second reason is perhaps a bit more complicated. Over the years, I have shared my personal cancer story and those of my family – my mom, dad, grandma, grandfather, and aunt. I have been moved by so many stories from the many survivors that I have the pleasure of knowing, and of others who have been taken from us to soon. This year, both my mom and my mother-in-law have lost life-long friends. 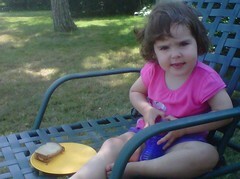 The mom of one of our daughter’s best friends is going through treatment for breast cancer now. I have struggled for months for the words to share about all of this. For each survivor I know or meet, there is a sense of validation. That the years I have devoted to raising money for the Dana Farber Cancer Institute have been worthwhile. That the $76,000 that you have helped donate in my name via the PMC and the collective $547 million that this event has raised since 1980 is making a difference. And then there is the flipside, that it is not enough, that we are still losing people each day that should be cancer survivors and live out the rest of their days. As one of these survivors, now for 21 years, I know this is the typical survivor’s guilt. It is part of Life With Cancer. It has always been these feelings – the validation and the guilt – that have motivated me to do this. To hop on a bike for 2 days and 200 miles to go across Massachusetts – at first, that was a challenge. Now, the challenge I have taken on is to advocate and help raise funds so that our kids and their friends don’t have to live in a world where their friends are lost to cancer when they are in high school, or college, or before they are married, or while their kids are still in school, or before they get to watch them get married, or before they get to hold their own grandchild and take them to their first game. Or to go on a bike ride with them. 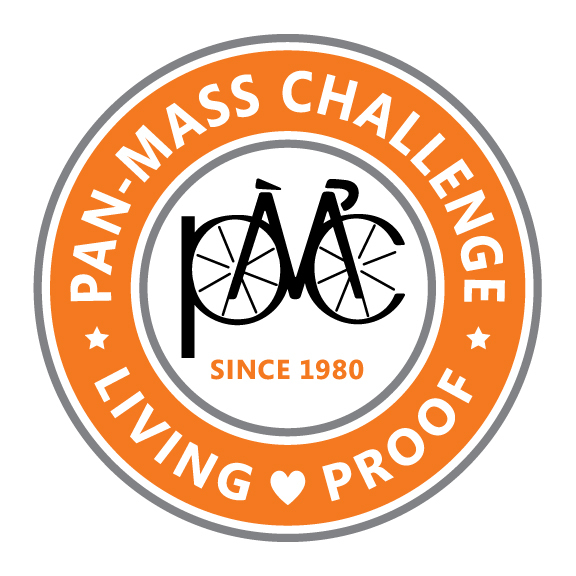 Pan Mass Challenge is the ultimate challenge: to defeat cancer. If riding a bike across Massachusetts with 6,000 other folks during the first weekend in August each year gives us the best chance to make this challenge a reality, then I’m the first to sign up. So, the PMC is only 2 weeks away, and I am a long way from my fundraising goal. I am writing to ask you and about 200 of my friends, colleagues, acquaintances, and family members to again donate. Everything that I have learned in the past 21 years, since I was first diagnosed in 1996, about cancer research has led me to believe that cancer will be made history, possibly even in our lifetime. It HAS TO BE IN OUR LIFETIME! But not without our help. That is why I ride the PMC – to help make this dream of a world without cancer a reality. Your continued emotional and financial support is what will make this happen. Please take a moment this weekend to make your donation on my PMC webpage. This year’s PMC, my 11th ride, will be my way to personally celebrate my 21st anniversary of my initial bout and 6th anniversary of my recurrence. PMC weekend is always very emotional for me. This one will be no different. It will be the first PMC with our new arrival, Adam Winston, along on the sidelines. While his arrival and watching our daughter graciously and lovingly become a big sister have brought us great joy this year, we have also lost too many family friends to cancer. We also have watched too many others, including my dad, go through the various stages of cancer diagnosis, cancer treatment, and cancer recovery. I ride the PMC because I don’t know what else I can do to end cancer except raise money, raise awareness, and be thankful for the opportunity to just be able to ride. As I continue training so I can ride 200 miles in 2 days in August, I say to you thank you for all you have given me through the years in your friendship and support and, of course, your generosity. Together, we have already raised more than $75,000 since I started riding. Since you are reading this now, I hope that you will take another moment to help me in the cause to help end cancer in our lifetime. Any amount is welcome, and I am grateful for your contribution. Thank you! The PMC raises more money for charity than any other single event in the country, $547 million since 1980 and $47 million last year alone! This success is the result of a lot of people riding for, and caring about, a cure. 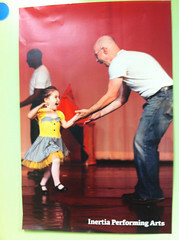 And because every penny matters, 100 percent of your donation goes to DFCI. I’ve made a personal commitment to ride and raise another $10,000 this year. I hope you can help me reach this goal as part of my 21st anniversary of survivorship. Make your donation to help end cancer today! Every donation brings us closer to the end of cancer. Every dollar matters in the fight to end cancer! Thanks to everyone who has donated!